It is a beautiful thing when life imitates art. Today only Krispy Kreme is giving away free Simpsons-themed doughnuts. But…there’s a catch. Doughnut panic, but your animated dreams are about to come true! Two iconic brands, The Simpsons and Krispy Kreme, have brought together the best of both worlds to launch Australia’s first official Simpsons D’ohnut. 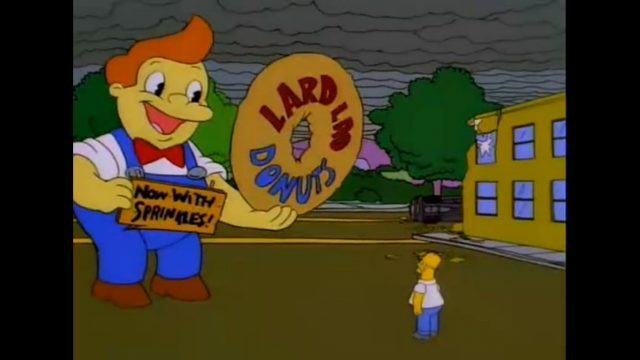 To celebrate the arrival of the pink frosted treat, Krispy Kreme is giving members of the extended Simpsons family a chance to try the D’ohnut for free. That’s right, today, anyone with the last name “Simpson” can redeem a complimentary D’ohnut simply by showing photo ID at their nearest Krispy Kreme store. If you doughnut make the giveaway this time around, you’ll be able to get The Simpsons D’ohnut from 7-Eleven and Krispy Kreme stores for a limited time, until April 30th, 2018. The Simpsons D’ohnut puts a decadent twist on the iconic cartoon treat, bringing together a holey trinity of ingredients. Starting with the classic Krispy Kreme Original Glazed™, the doughnut is dipped in strawberry-flavoured white chocolate truffle to achieve the unmistakable pink hue. And of course, no Simpsons D’ohnut would be complete without coloured sprinkles! Mmm, sprinkles. To tie the launch together, the Simpsons D’ohnut will be available in a bespoke box featuring Homer Simpson, designed exclusively by the artists behind our favourite television family. We’re quite sure you won’t be able to avert your glaze! Aussies can get their hands on the official Simpsons D’ohnut by visiting Krispy Kreme or 7-Eleven stores in New South Wales, Victoria, Queensland and Western Australia. For a complete list of Krispy Kreme stores click here.